Extensive annual rust surveys were undertaken throughout the wheat growing areas of Bangladesh during February-March 2014. The surveys were coordinated by Dr P.K. Malaker of the Wheat Research Centre (WRC), Dinajpur, but implemented by several collaborating stations, including; Dinajpur, Joydebpur, Jamalpur, Jessore and Rajshahi. A total of 230 different locations were covered by the survey teams. 2014 was a favourable year for wheat rusts in Bangladesh. It was exceptional in the respect that all three rusts were recorded on the survey. 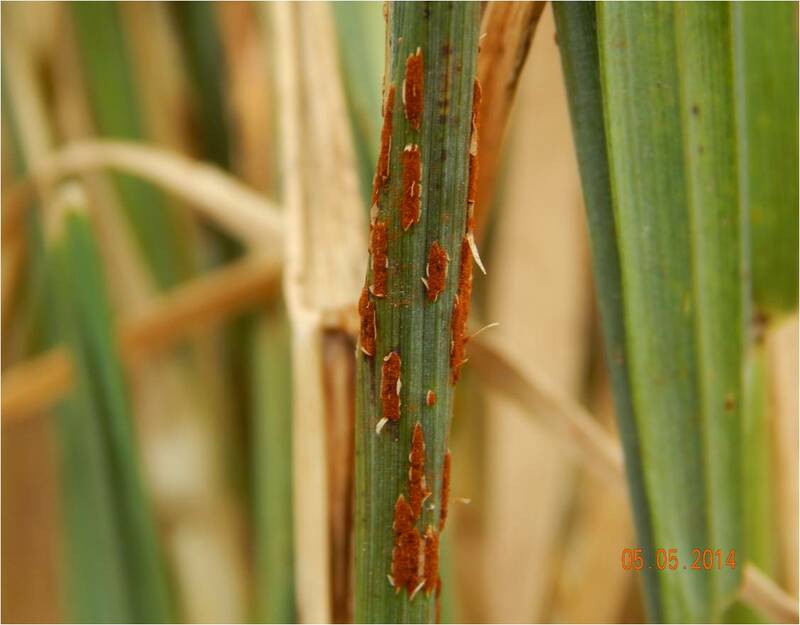 leaf rust was the most frequent with much higher disease pressure than in previous years. Leaf rust was very widely distributed, being present throughout the wheat growing regions of Bangladesh. Almost 90% of the sites surveyed (n=197) recorded leaf rust, and 50% of these had high or moderate severity. Highest severity was recorded in the north-west and western wheat growing areas of Bangladesh (Map 1). The popular variety ‘Prodip’ was notably susceptible to leaf rust. and urediospore morphology were examined at WRC, Dinajpur and ascertained to be of stem rust. Samples were collected and are undergoing race analysis at DWR Regional Station in Shimla, India. These would probably represent the first stem rust records from Bangladesh in three decades. Yellow rust was recorded only at WRC, Dinajpur. The disease was found on the rust susceptible check variety Morocco in a trial plot. Yellow rust is infrequent in Bangladesh, but does occur sporadically.